Description: Perennial; stems erect, or seldom climbing or twining and sprawling; leaves 2-(3-) pinnate with 7-11 leaflets; leaflets thin, glabrous, usually greater than 1.5 cm wide and less than 2.5 times as long as wide, not prominently reticulate, appearing palmately lobed, but sometimes pinnately lobed, with 2-5 mostly ovate lobes; flowers terminal, solitary, urn- or bell-shaped; sepals petaloid, purple, often with white woolly margins, thick, lanceolate, 1.5-3.0 cm long, petals absent, mature styles 3.5-5.0 cm long, plumose. Flowers May and June. Similar Species: The leaflets of Clematis hirsutissima are usually less than 1.5 cm wide, greater than 2.5 times as long as wide and pubescent on the lower surface. Distribution: New Mexico, Bernalillo, Lincoln, Grant, Sandoval and Sierra counties; adjacent Arizona. Habitat: Moist mountain slopes and shady, rocky canyons in pion-juniper woodland to upper mixed conifer forest; 1,500-3,300 m (5,000-10,000 ft). Remarks: This species occurs in Sandoval, Bernalillo, Lincoln, Sierra, and Grant counties, New Mexico, and at a few sites in immediately adjacent Arizona. This range from north-central to southwestern New Mexico is well over 100 miles. The Flora of North America says it is locally common and several in the Council confirmed that this is true, at least for the Sandia Mountains. The species does not meet our criterion of being infrequent throughout its entire range if the range exceeds 100 miles so it does not qualify as a New Mexico Rare Plant. 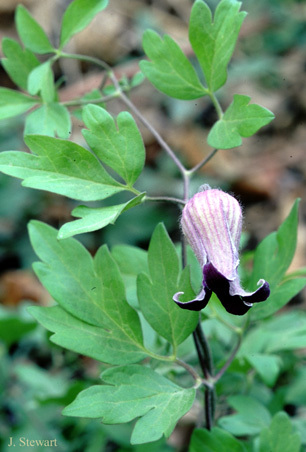 This taxon is sometimes included in Clematis hirsutissima because of the similar growth habit, but the leaflet shapes differ in length and margins. It cannot be readily differentiated from the sympatric C. palmeri, and the two may be synonymous. Clematis bigelovii may be locally common in New Mexico, but its populations are sporadic. Conservation Considerations: This plant does not appear to be seriously impacted by the prevailing land uses within its habitats. *Ivey, R.D. 1998. Flowering plants of New Mexico, 3rd edition. Published by the author, Albuquerque, New Mexico. Carter, J.L. 1997. Trees and shrubs of New Mexico. Johnson Books, Boulder, Colorado. Flora of North America Editorial Committee. 1997. Flora of North America, volume 3. Oxford University Press, New York.